I'm talking like a couple of weeks soon for this EP from The Dream. The singer took to his social media to make the announcement about Love You to Death, which is set to be released on December 9. Is this good news to your ear? Have you been looking for new music from The Dream? The Singer/Songwriter released a visual album titled Genesis at the beginning of the year and now he is back with more new music. 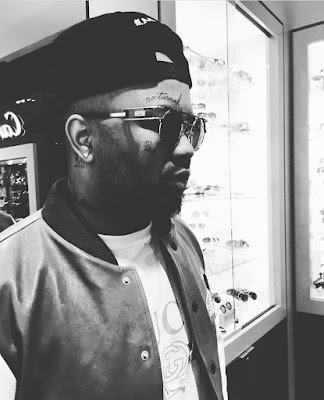 With the new music, The Dream also debuted some new tattoos.... face tatts to be exact. Now I don't know if they are real or not but ummmm, do ya thang young man. We already know that The Dream gives some great music, as well as helps other artist put out great music. He has recently helped out artist like Tinashe, Beyonce, Sevyn Street, and Kanye West, just to name a few. Don't ever think that Mr. Radio Killa is not working because he makes sure to keep busy. We are going to have to see exactly what he does with this EP Love You to Death, but I'm sure that he will not disappoint. Will you be checking out the EP when it drops?